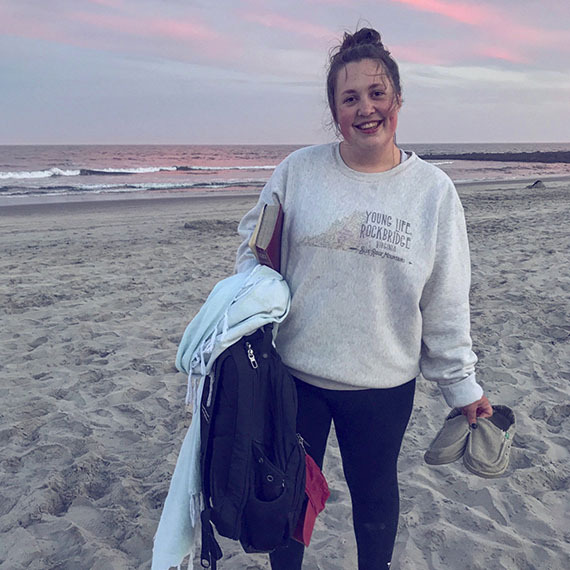 And as I obeyed the call of the Lord and headed for the CCO’s Ocean City Beach Project—as I pulled out of the driveway, and several hours later pulled into the parking lot of the place I would be living all summer—the answer to my selfish plea was answered, for I was here to give everything. This sacrifice was not limited to leaving behind the people I love the most. As a person who loves comfort and is terrified of change, entering a room full of girls I had never met before was particularly difficult. Not only did I now have to share a bedroom with strangers, I also had to get to know the rest of the people living in my house. I didn’t know who they were, or what they were like, or even if we would get along. But I watched God’s faithfulness unfold in the days to come as we asked each other questions and listened to each other’s stories. However, it was not until one particular day that I finally understood what my summer was all about. I got up and left for work like any other morning, smelling the salt water and feeling the breeze hit my face as I continued my walk. My summer job was serving tables at a restaurant. I entered through the double doors, picked up my apron, notebook, and pen, poured a cup of coffee, and sat down at the table to wait my turn to serve guests. Waiting with me was one of my fellow co-workers, Johnny, a student from Croatia visiting the United States to work and bring his profits back to his country. As the weeks continued, our conversations did not end. Johnny noticed something different about how I lived my life and why I acted the way I did. And while he may not have given his heart to Jesus that day, a seed was planted. Over the summer months, I came to know that God desires no less and no more than everything of what we have. That means our conversations and our time, and leaving the comfort zone of home because He needs us in places and situations to help others see just a bit of His goodness. I have seen God’s good news affect everything that I do, from the way we cooked dinner for a household of 31, to the way we presented ourselves at work, to the way we had discussions about life and the Gospel with one another until 2:00 in the morning. It is in the trivial, small, minute tasks of the day as well as the large tasks that God asks us to live by the truth that the Son of God came to earth to save the souls of wretches like me, that my time on earth is not mine, and that every aspect of life is transformed by the good news that Jesus saves. Every crashing wave, every grain of sand, every hair on my head, every tear that falls from my eye is held in the hands of the heavenly Father who desires to restore brokenness to a right relationship with Him, and that is something to have hope in. That even when I don’t bring all that I have to the table or miss the mark, God shows forgiveness, mercy, and grace, transforming my life and the world to look more like His. But as we know, all seasons come to an end. My time at the Beach Project is over. That does not mean that my work of giving everything that I am to God’s work is finished, for we came to leave. It is time now for me to enter into a new season of growth, evangelism, disciple-making, community, fellowship, and seeing a little more of heaven brought to earth: this time in Youngstown, Ohio. And as I strive by God’s power to give of everything that I am for His work, in the trivial tasks of the day as well as the large ones, I am excited to see God work and move and be knownand to see Him do things on my college campus that I can’t even begin to dream or think or imagine. —Elizabeth Bell is a social work major at Youngstown State University. She plans to graduate in December 2018.